The receptionist at the law firm where I work told me that she will have no children at home within the next six months. Her daughter with the baby is interviewing for special housing, her son is moving in with friends in May, and her youngest is moving into her own apartment to attend college in August. What a change that will be for her and her husband. The empty nest may come upon Ralph and me sooner than I think. Will is already gone. Patty plans to leave in a year or so after graduation this spring to go on to graduate school. And Mary wishes to leave as well. On Saturday, Mary went grocery shopping with me. Usually, when I drag one of the girls out to the grocery store, we also go out to eat. I started taking my kids out individually for lunch or breakfast on a rotating basis when they were in their early teens, so that we could talk without the other ones butting in. Both Will and Patty were talkers. At first, getting Mary to carry on a conversation was halting, difficult. She would not look at me. Her voice was so soft, I could barely hear her. At Steak and Shake, Mary informed me that she was looking forward to moving to her own apartment. I said that she would need an apartment that was within a short distance to a bus stop and shopping. I suggested that she might want to live with her brother, Will. She shook her head. She doesn’t want to live with Will, she wants to do what Will has done, have her own apartment and her own life. In order to move away, she said she needs to get a steady job. Then she told me that she was going to an interview at Goodwill on Monday. They have a training program for a high tech call center. Surprise! I don’t know if she has the ability to learn C++, but she does keep the computers running around here. “I can’t wait,” I said. “How will she get groceries, go to the dentist, go to the doctor. We have to think about these things. Plan for her.” But this isn’t my job or my place. I have to let go to the extent that we can. The truth is, Mary is making plans, taking steps to make her wishes come true. She has been planning for years. Even though she can’t drive, she is going to ride the bus to her interview tomorrow and back. She can get around. Mary can take care of herself, in many ways better than her brother could when he moved into his apartment. She does laundry, cleans house, and cooks. She has accepted the fact that she cannot drive, so she plans to get around on her own. We have insisted that she try to find a job which is easily reachable by bus. As tempting as it is to say we would drive her to job inaccessible by bus, her independence is dependent on the bus. Above is a picture of Will’s apartment after he moved in. To say his furniture was sparse is an understatement. 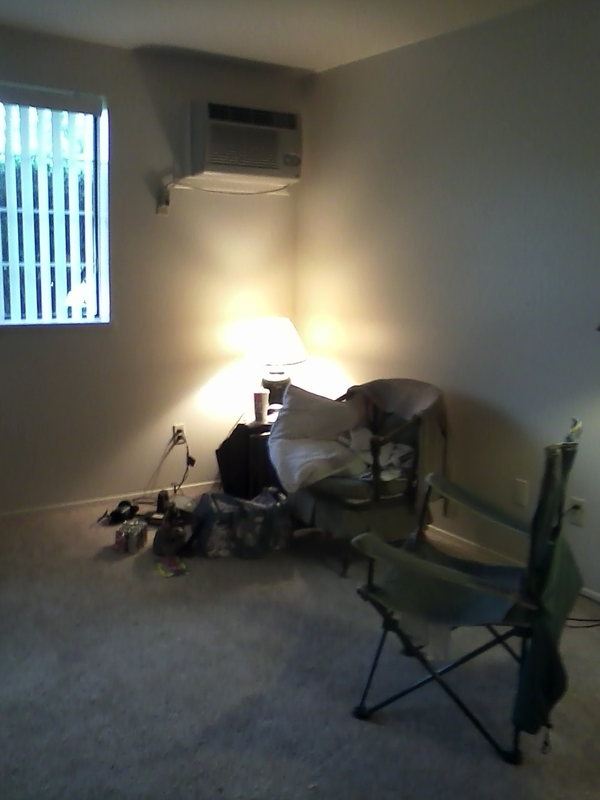 But Mary has her own bed, a recliner, desk, office chair, TV, bookcases. I would encourage her to buy dressers, lamps, etc. Mary is vulnerable, and that is one of my fears. But I must let her go at some point, whether it is to supported living or totally independent living. A year or two ago, I dreamed that Mary had moved into her own apartment, and I walked through her apartment looking at her cupboards to make sure she had enough food. I opened the refrigerator door to peak in, to see how the food supply was. I went through the same process with Will after he moved. After a while, I stopped prying into his cupboards, except now to ask where he keeps the sugar or coffee filters. My wishes are that she would be safe, and able to take care of herself. Mary’s wishes are to be independent, have a job, make her own life. I need to step back and let her live her life. To leave the harbor, so to speak. That is what ships are for, even for Mary. Will called twice this week for cooking instructions for some of our basic meals at home. He is moving beyond frozen pizzas and corndogs. Like ironing, the lessons mean much more when he has to sink or swim, when his choices are corndogs or spaghetti, frozen pizza or pork roast prepared in the crockpot. So we gave him instructions over the phone. It is sort of like operating a robot blindly. On Wednesday, he wanted to make our version of Barbecue, which is really hamburger and onions with his father’s doctored tomato sauce. 1 pound hamburger sauteed with chopped onions sprinkled with salt and pepper. Stir in one 8 oz can of tomato sauce with brown sugar, oregano and garlic. Simmer until the right consistency. I don’t know the proportions. This is his father’s recipe, so Ralph gave the instructions. We don’t know if he is getting it right because we can’t see him preparing. Oh yeah, I think there might be ketchup, and a little mustard. 1 pork roast; place in crockpot; empty envelope of onion soup mix on top; pour 1/4 cup water around the edges so the onion soup mix is not washed off. Turn the knob on the crockpot on high for four to six hours, then on low for two hours. (I tell him the crockpot must be turned to high to prevent food poisoning). Then how to cook rice the Korean way. Then how to make Dorothy sauce. Combine 1 cup ketchup with 1/2 cup brown sugar, 1/4 cup Worcestershire sauce, and two squirts of yellow mustard. Cook on low (1/3 inch flame), stirring slowly until bubbles appear around the edges and the color turns a deep maroon. It must have worked; he ate it all week for his lunch at work. Most of our family recipes are simple. In the world of Autism Spectrum Disorder (ASD), labels opened the door to services such as social work, speech therapy, quiet rooms, therapeutic horseback riding, one-on-one swimming lessons, etc. At some point, however, the label is not just a topic of discussion and planning among parents, teachers, and therapists. In Michigan, the student is invited to at least part of the Educational Planning meetings beginning in middle school, or at the latest, high school. This is the beginning of the transition process to self-care, to self-advocacy, to independent living. Eventually you do have to have the “big talk” and I am not talking about the birds and the bees (although that is another delicate issue). We had to tell our kids that they are autistic. When I had the big talk with my children, my oldest daughter accepted it readily, but then she was in an autism classroom (partially mainstreamed). My son felt bad about it, but eventually came to accept it. My youngest daughter was angry and mad about it – and has not and will never accept it (her words). Even though she needed speech therapy, she made the visits with the speech therapists miserable. We finally had to pull her out of speech therapy because of her attitude. Admittedly, she has fewer autistic traits and more typical teenage traits as a trade off. She is more neurotypical than her sister and brother. She is aware of the world around her and other people. On the other hand, her attitudes can be off putting, and she seems tone deaf as to how she sounds to other people.